Them sprinters are big guys — I passed them in the tunnel tonight, they looked cool, cocky, stylish. The public here love the sprinters; at intro time, they actually get their big build up from Daniel Mangeas after the Six Day riders. Bauge did a standstill for more than half-an-hour, in Gent there would be bricks getting lobbed at him, but in Grenoble — they love it. Mangeas talked non stop for the 34 minutes whilst Sireau plied Bauge with champagne. Bauge wasn’t tempted by the glass of champers. There was a visit from Tour de France organiser, Christian Prudhomme tonight, he had the Indian snake charmer’s boa wrapped around him; there are all sorts of thing we could say — but we’ll keep schtum. I interviewed Luke Roberts tonight, he’s a cool guy and can perhaps lay claim to being the best team pursuit rider, ever. He has National, junior Worlds, senior Worlds, Commonwealth and Olympic team pursuit titles to his credit; not to mention two Worlds silvers in the individual pursuit. We’ll get that on the site once I have time to write it up. Jens Erik has a shot of the snake. I did a telephone interview too, with Tom Faiers — never heard of him? He’s British, 22 and just signed Pro Tour for Footon-Servetto, he’s never raced in the UK; he was a tri-athlete who went on a Baxter tour, liked Spain, stayed there, stuck with it and now he’s on the ladder — respect! We’ll get that up too, one of these days! On the subject of interviews, I’m provisionally booked to talk to Iljo Keisse, tonight — wish me luck. Iljo’s looking good, but our young Swiss out-kicked him in a photo finish to win the Devil tonight — nice one, Tristan! There was a football match on next door — the stadium looks amazing in the dark; not as nice as Starks Park, you understand, though. 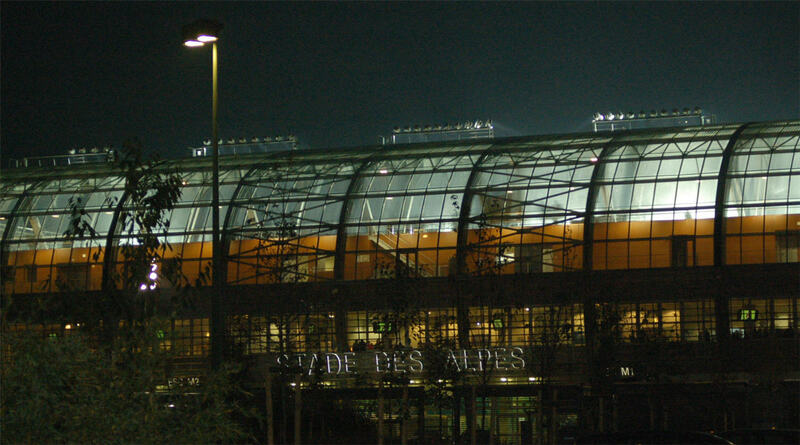 The Stade Des Alpes football stadium looks great at night. So does the velodrome, to be fair. The racing was good, but the differences are beginning to show; despite having a little cold, Franco is rampant, meanwhile the French guys get more and more tired. 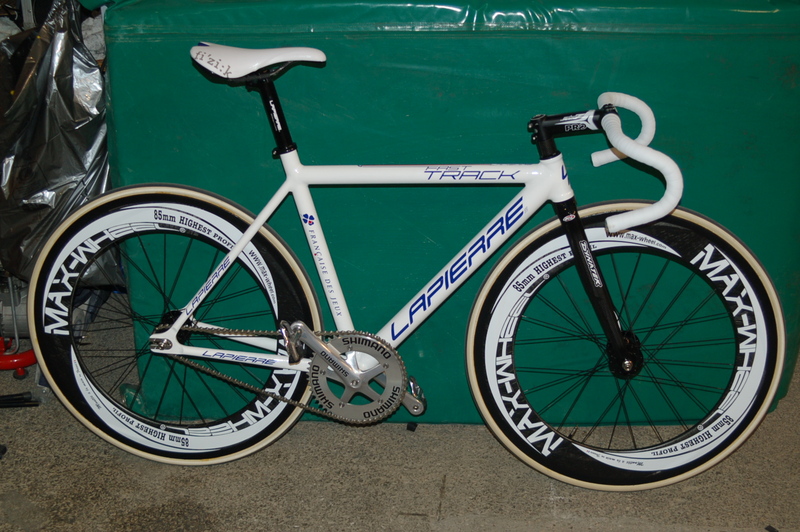 Bike-wise, frame material is pretty evenly split between aluminium and carbon — for me, one of the best looking machines here is Gianni Meersman’s Lapierre, understated but elegant. And for a small rider, he manages to get the proportions nice. Meersman was the ‘next big thing’ in Belgium for a while; he was signed by Disco, but maybe too much, too soon? He’s looking the part here, but will maybe find it tough at Gent where it’s “warp factor five” from the off. Daniel and Jens look a little tired tonight. Folks ask me why Bruno Risi isn’t here — the answer is simple. Tristan and Franco mix it up. Reigning world champions, Alex Rasmussen and Michael Morkov have won the last two editions of Grenoble, but went for the bigger pay day at Dortmund, this year. No rider is bigger than the race, here. Ed catches Franco after his Elimination Win lap of honour. I’m finishing this piece off in the cabin on Sunday aftenoon, Erik is bored and playing with my camera; Franco needs a toastie — better go, au revoir! 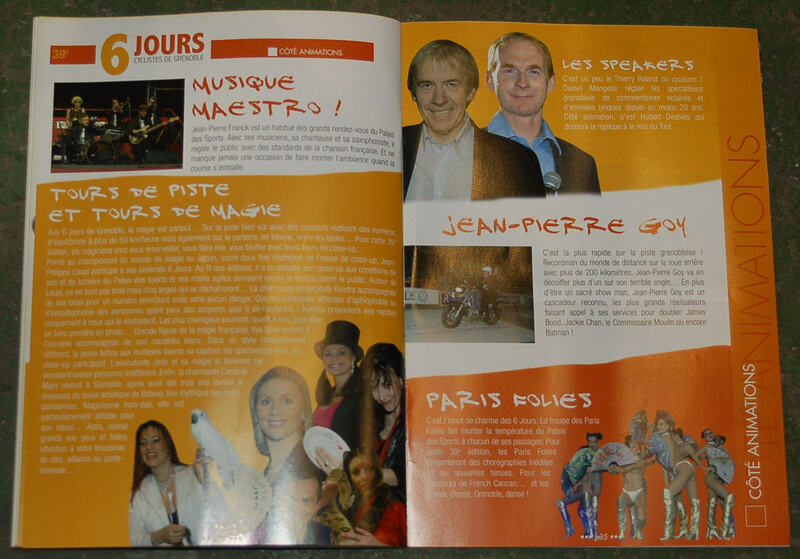 The sun is hot even at 07.15, the autoroute is quiet, straight and fast; we're headed for le Tour and Loudenvielle Le Louron; Millie Jackson is telling us that her man is a "fine man" - what more could you want from life? It's 10.00 am now and we're on the descent off the first climb of the day, the second cat, Col de Port or Portet, depending on which sign you look at. Martin got his first look at le Tour village this morning, as always, the scrambled eggs were great and the coffee strong.